the No. 2 Hurricanes to a win over College Football Hall of Fame coach Barry Switzer and No. 1 Oklahoma. This report researched and written by NFF Assistant Director of Communications Zach Barnett. September 24, 1994: In one of the most famous plays in recent college football history, Colorado quarterback Kordell Stewart heaved a 64-yard Hail Mary that tipped into the hands of wide receiver Michael Westbrook to give the No. 7 Buffaloes a stunning 27-26 win over No. 4 Michigan in Ann Arbor, MI. Trailing 26-14, the game was seemingly over for Colorado after Stewart lost a fumble at the Wolverines' goal line with 5:08 remaining. However, the Buffaloes rallied behind tailback Rashaan Salaam's (22 carries for 141 yards) second touchdown of the game with 2:16 left. The Buffaloes defense then forced Michigan to punt, leaving six seconds for Stewart (294 passing yards, two touchdowns) to find Westbrook for the highlight reel catch. September 25, 1965: College Football Hall of Fame coach Jack Mollenkopf led No. 6 Purdue to a 25-21 win over College Football Hall of Fame coach Ara Parseghian and No. 1 Notre Dame in West Lafayette, IN. College Football Hall of Fame quarterback Bob Griese nearly won the game single-handedly by completing 19-of-22 passes for 283 yards and three touchdowns, pinning the Fighting Irish twice within their own 10-yard line as a punter and making a touchdown-saving tackle of Notre Dame's Bill Wolski on a kickoff return. Trailing 21-18 in the fourth quarter, Griese drove the Boilermakers 67 yards, capped by halfback Gordon Teter's game-winning three-yard plunge. The win was Purdue's second of three over a top-ranked team in Mollenkopf's tenure. September 26, 1964: Kentucky stunned College Football Hall of Fame coach John Vaught and No. 1 Ole Miss 27-21 in Jackson, MS. Despite being outgained 415-187, the Rebels stayed in the game through an 89-yard interception return score by James Heidel and a 65-yard pick six by Tommy Luke. Ole Miss took a 21-20 lead in the fourth quarter, but the Wildcats responded with Rick Kestner's third touchdown catch of the game with just 2:38 remaining. The Rebels again threatened to steal back the lead but tailback Mike Dennis lost a fumble at the Kentucky 20-yard line with 30 seconds to play. September 28, 2002: No. 19 Iowa State scored its largest margin of victory over No. 20 Nebraska since 1899 with a 36-14 triumph in Ames, IA. Cyclones quarterback Seneca Wallace was the star of the day, completing 19-of-32 passes for 220 yards and a touchdown while adding seven rushes for 50 yards and two scores. The win knocked Nebraska out of the AP top 25 for the first time since 1981, a streak of 348 consecutive polls. September 29, 1984: Western Michigan's Mike Prindle posted the most eventful day for a kicker in college football history by becoming the first player to attempt nine field goals and connect on seven tries in a single game. Prindle, who also recorded three extra points, also set an NCAA single-game record with 24 points. The Broncos defeated Marshall 42-7 in Kalamazoo, MI. September 30, 1978: Army celebrated Earl "Red" Blaik Day, the NFF tri-founder and College Football Hall of Fame coach, in front of a capacity crowd at Michie Stadium in West Point, NY. The Black Knights, however, fell behind visiting Washington State 21-0 at the half until Blaik addressed the crowd during intermission. The speech worked, as Army fought back to force a 21-21 tie while intercepting Washington State quarterback Jack Thompson three times and rebounding to outgain the Cougars 377-297 on the day. 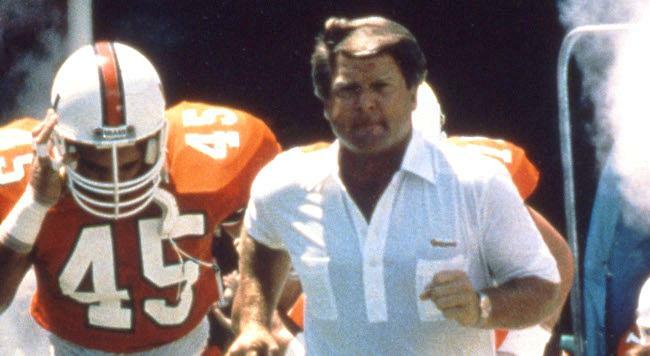 September 27, 1986: College Football Hall of Fame inductee Jimmy Johnson led No. 2 Miami (FL) past College Football Hall of Fame coach Barry Switzer and No. 1 Oklahoma 28-16 in Norman, OK. The Hurricanes, leading 7-3 at halftime, broke the game open with three touchdown passes by quarterback Vinny Testaverde. Miami's defense limited the prolific Oklahoma rushing attack to just 186 rushing yards on the day. The win propelled Miami to an undefeated regular season and an appearance in the Fiesta Bowl. Johnson would lead the Hurricanes to the school's second national title one season later.